It’s a side of San Francisco that locals know well but visitors often miss. No, not the ethnic neighborhoods the Olders are so fond of — the Golden Triangle. Golden Triangle? Around 1915, that used to be Market, Powell and Sutter Streets, downtown. 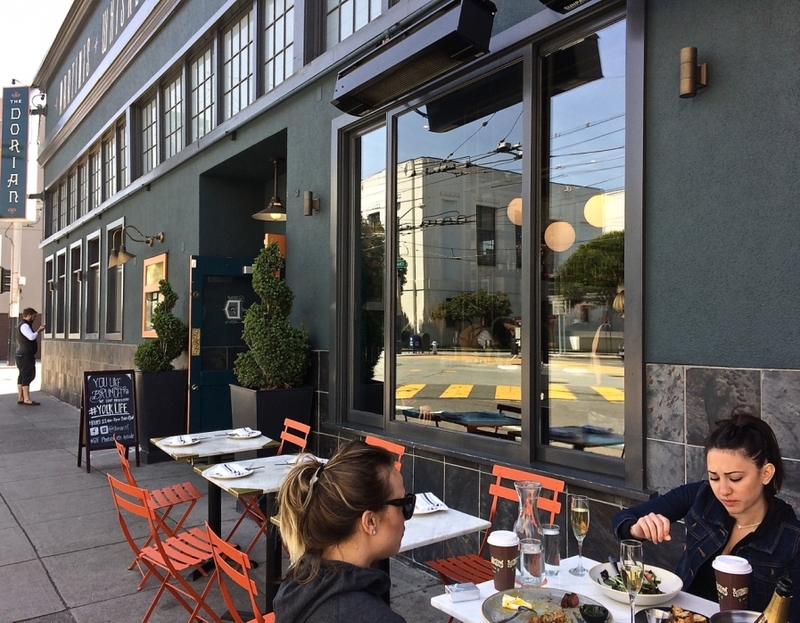 Today, it’s Chestnut, Union and Fillmore, in Cow Hollow and the Marina. What makes it golden? Boutique clothing shops. Hip bars and swinging clubs. A multitude of restaurants. And the young, affluent and/or aspiring, smart and/or pretty denizens of the Golden Triangle who live and shop, flirt and eat here. Many consider the corner of Chestnut and Fillmore the vertex of the triangle. And here, at 2001 Chestnut Street, a couple of short blocks from the Marina’s Apple Store, sits The Dorian. The best time to dine with the locals is brunch. Which means Saturday or Sunday, from eleven to three. Bring time and an appetite. Time because the kitchen plays constant catch-up with the crowds. Your food will come but not right away. The wait-staff is cheerful and enthusiastic, but they’re playing catch-up, too. This, the price of popularity. In addition to a few outside tables on Chestnut, The Dorian has several rooms and corners, plus a busy, eat-at bar. It’s loud but not deafening, quirky but not bizarre. And the food is tasty and plentiful. Definitely worth the wait. The Chef’s Favorite is the $16 #Yolklife Sando. (That hashtag is your reminder that you’re in Digital Age San Francisco.) It’s an enormous sandwich whose ingredients include a sunny-side egg, Hobb’s sausage, bacon jam, fried green tomato, aged cheddar, chorizo and aioli. Unless you have the appetite of a hungry ape, best share it. The $13 spring market salad is nearly as large. Add six or seven dollars to top it with generous portions of chicken or shrimp. And maybe order the truffle fries to balance all that green. The small dessert menu includes a $9 butterscotch bread pudding that’s moist and sweet but not cloyingly sweet. The Dorian. 2001 Chestnut Street, at Fillmore. Dinner served Tuesday-Sunday, brunch Saturday and Sunday. www.doriansf.com. Reservations via the website, through www.OpenTable.com and (415) 814-2671.